Hi all, I had my first follow-up visit with my doctor yesterday since being diagnosed with diabetes. It went very well!! I have been working hard at keeping my blood sugar levels balanced and have succeeded 85% of the time within a 7 week period!! And have lost a total of 40 pounds, so far since the first of the year. I am well on my way. Being on medication my skin is now very sensitive to the sun. I went to an awesome baptism/bbq this past Sunday, and though it was way to hot for me, the fellowship was fantastic! Knowing I would be exposed to the sun, even for a short time, I made sure to wear our SPF 30+ Sheer Moisturizer. Anyone who knows me knows how fair I am and I didn’t get even pink! This stuff works like a gem. Our SPF 30+ Sheer Moisturizer is “broad spectrum” sun protection. What that means is: this bonding base formula interlocks with skin completely blocking out UVA and UVB sun rays. UVA are the rays that age us and UVB are the rays that burn us. It feels weightless and allows skin to breathe; it is also oil free, paba free and fragrance free. It is suitable for all skin types. Now through the end of August our SPF 30+ sheer moisturizer is 20% off. If you mention this blog we will give you an extra 10% off!! So stay safe by using sun protection. Give us a call to let us know when you want to come in to get your sun screen or are looking for more information on sun protection …. 425-6511. Skin Indulgence has been through allot of changes in the past couple of years, some good and some not so good. Changes that have affected the shop professionally and changes that have affected me (Karen/owner) on a personal level. And the economy has put its two cents in also, if you will. I want to take a few minutes of your time to share a new journey I am on in hopes that you will join me while I travel this path. There are sure to be some laughs (how can there not be with me), a few bumps, even some tears but guaranteed a whole lot of new things to learn! A couple months ago I learned that I have type 2 diabetes. Now before you go into your “poor thing” or “that’s too bad” mode, know that it really isn’t all that bad; at least not on most days. Seeing we caught it in the early stages, I don’t have to have insulin shots, praise the Lord for that. But I am on medication 3 times a day and have to test my blood two times a day (And that wasn’t so fun in the beginning or sometimes even now, seeing I have quite the fear of needles; a posting for another day). With all the new things going on in my body and new medication, my skin is on over drive as well as my hair, nails, the way my make wears, not to mention my emotions. As a Christian woman with a personal relationship with Christ, I know He has my back on this! Despite the gloomy out look, that some have, I believe new doors are opening in many areas of my life, thus a new journey! I want to share the ups and downs of this new adventure and all the things I am learning through my personal experiences with skin care, make-up, hair care and even tips on food and exercise along with the emotional side of things in hopes that you will be blessed and learn something for yourself or someone else you know that my be dealing with these or similar issues. Please feel free to leave comments, questions or ideas and check back every week or so for new postings!! God has placed me in front of the mirror to be Face 2 Face with Beauty and has asked me “What is beauty?” So I ask you, what is beauty to you? As for me, it is many things and I’m just starting down the road to finding out what true beauty is…. Will you join me? I know, I know.... we have been away from here far to long. Please except our heart felt apology for not keeping in touch and sharing all the great new things that have been going on at Skin Indulgence in the past couple of years. But we are here to say that WE R BACK!! Let me catch you up to speed..... some of you may know that Laura is no longer with us. Her hubby got orders to relocate and she and her family have moved on; she has been missed greatly. Meanwhile we have another massage therapist with us, Cynthia. She has been a great addition to our little family and I think all of you will also enjoy getting to know her. We have also added two Estheticians, Manuela and Oana. 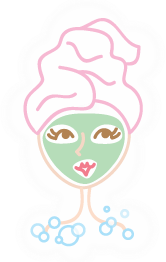 Though they also do facials, they focus more on the medical end of skin care. Skin Indulgence is proud to say that we have our own skin care line: 2C Creations. A line of products that I have worked very hard at developing to meet the needs of our clients without any harsh ingredients and all natural botanicals. We are getting ready to launch another addition to our skin care line..... Creative Solutions. A line of products with a higher percentage of active ingredients to fight harder to meet your skin care goals. It will launch the end of this month, Oct. 2011!! Mark your calendars for Saturday August 15th between 10am – 4pm and come join us for some fun! We’ll have some light refreshments with a yummy lavender lemonade you just have to try. Then treat yourself to a free neck, shoulder and hand massage before heading back out in this summer heat! And the best part of the day, you may be asking… SALES! Lots of them!! This is a great time to stock up on all your skin care needs. Try one of our great serums at 20% off. Buy a second 2CCreations skin care item and receive an additional 5% off your total. There are also lots of other gift items up to 70% off and all scripture bracelets 10% off. Our fabulous treatment special is a fresh revitalizing aromatherapy facial or massage for $55.00. Sixty minutes of pure bliss for all the senses! Book your appointment the day of the open house (August 15th) between the 19th of August and the 19th of September and get your treatment for only $45.00! The big once a year Face and Body Trade Show was in town (San Jose) this weekend. It’s a weekend filled with enough education to put anyone in over-load mode and the exhibit hall is a candy store for any spa product junkie! We bought a few new items that we will be trying out to see if the results are up to our standards to pass on to you. Stay tuned for more information. We attended class after class with pages and pages of notes on valuable information that we will be sharing with you in the future weeks to come. The “new” buzz words, all over the show were Hyaluronic Acid and Peptides, two very important ingrediences for anti-aging skin treatments. When these ingrediences are mixed with the proper skin care products in active amounts, you can have outstanding results in younger looking skin. They deliver results because Hyaluronic Acid and Peptides are naturally found in the body so they work together at strengthen what you already have naturally. Hi everyone, sorry it's been awhile since I have last posted but life happens to us all, sometimes. The good news is, I have been working on some new things and trying out some new fun products due to hit the shelves later this summer that will knock your socks off! For now we have some super great savings you won't want to miss. Sale goes from June 1st - July 18th. Thank you to all who helped us bring awareness to Self-Injury, these past couple of weeks. We were able to raise $180.00 to put towards helping other young women with their hurts, habits and hang-ups through Mercy Ministries. Thank you again! A new post coming soon about a NEW facial treatment: “Smooth as Silk” one you won’t want to miss. It promises to deliver phenomenal results. Check back SOON….. Copyright © 2009 Skin Indulgence. All rights reserved.